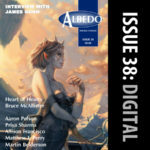 17 December 2016 – Albedo One issue 47, at a bumper 88 pages, features fine cover art by Antonio Javier Capar, as well as art work (back cover) by Teis Teng to accompany his mesmeric story, “The Cowboy who Loved Lady Liberty”. 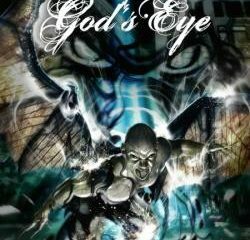 Also in this issue is Bruce McAllister’s poetic “A Beautiful Day”, a short piece with a powerful emotional punch. 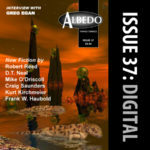 This issue features two translations, the first from German by Tommi Brem of Karla Schmidt’s wonderful “A(way) with Stella Maris”, winner of the 2009 German Science Fiction Prize, and the second from Italian by Paul Virgo is Michele Piccolino’s touchingly humorous fantasy, “The Curse of the Di Blasio Agresti Salottolo Illiano De Scisciolo Prize”, winner in 2014 of the 20th Trophy RiLL Contest. 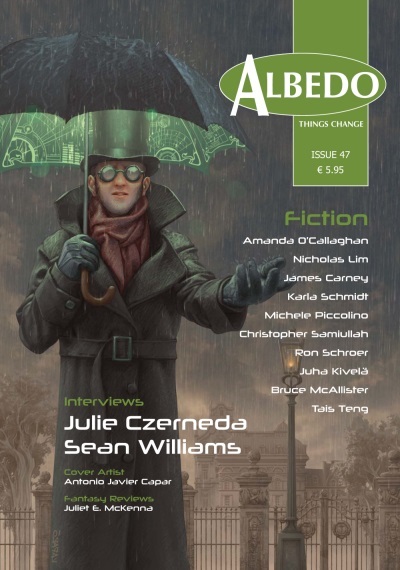 This issue also brings you the winners of the International Aeon Award Short Fiction Contest 2013 and 2014. From 2013, we have in 1st Place “The Painting” by Amanda O’Callaghan, in 2nd Place “The Bottle Shop” by Nicholas Lim, and in 3rd Place “Ever Closer Union” by James Carney. From 2014, we have in 1st Place “Bodyware” by Chris Samiullah, in 2nd Place “Lustbader” by Ron Schroer, and in 3rd Place “The Deepfolk” by Juha Kivelä. 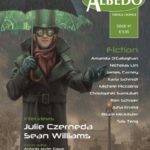 To round off the issue, we have two interviews with Julie Czerneda, and Sean Williams, and our continuing review column by the superb Juliet E. McKenna. Not an issue to be missed. Buy it on the present page in pdf or here in print.